Summary: The disputed breakaway state of Abkhazia has gained diplomatic recognition from Vanuatu, the fifth U.N. member to acknowledge its independence from Georgia. claimed location within Georgia. Wikimedia map by Ssolbergj (CC BY-SA). The Republic of Abkhazia is one of seven states in the world which are recognized by some U.N. members, but not by the U.N. as a whole. Located in the Caucasus region on the border between Europe and Asia, Abkhazia is considered part of Georgia by most U.N. members; however, it has enjoyed de facto independence since winning a war of secession against the larger country in 1993. 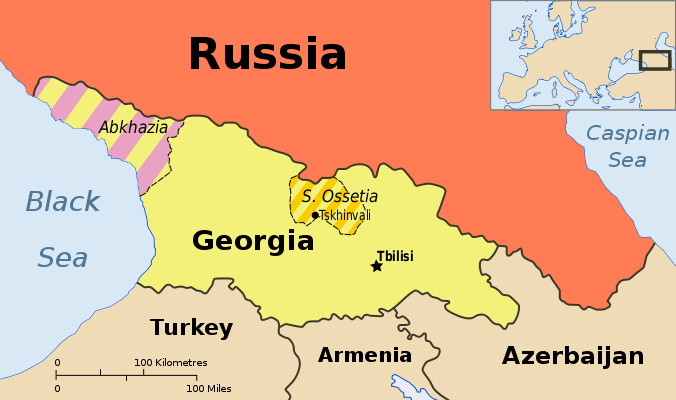 It has shared much of its fate with South Ossetia, another breakaway state which also seceded from Georgia around the same time. Abkhazia and South Ossetia passed their first decade and a half of independence without the recognition of any U.N. members. That changed after a 2008 war in which Georgia attempted to take back the two breakaway states by force, and was repelled by Russian forces. 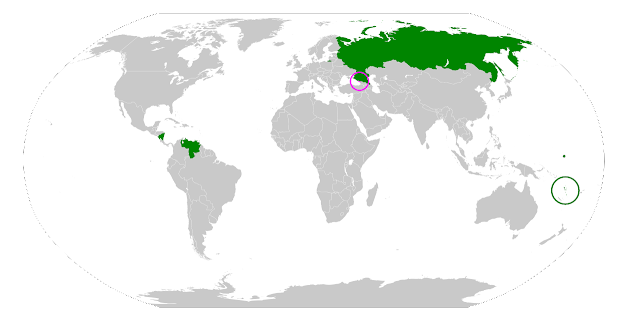 In the aftermath of the war, both Abkhazia and South Ossetia received diplomatic recognition from Russia, as well as from the Central American Republic of Nicaragua. The next year, South America's Venezuela and the Pacific island country of Nauru followed suit. The two breakaway republics are also recognized by each other and at least two other non-U.N. member states. U.N. members recognizing Abkhazia shown in green. Vanuatu circled in green, Abkhazia circled in pink. Modified from this map by Wikimedia user NuclearVacuum (license: CC BY-SA). This summer, Abkhazia received recognition from a fifth U.N. member, the Republic of Vanuatu. For the first time, South Ossetia was not recognized along with Abkhazia. Vanuatu is a Pacific island country of a quarter-million people, formerly known as the New Hebrides, which won independence from Britain and France in 1980. Vanuatu's recognition of Abkhazia this year was accompanied by a great deal of confusion. Negotiated in secret between the two states, the recognition agreement was first announced to the public at the end of May. However, government officials in Vanuatu gave differing reports on whether or not the agreement existed, with confirmation finally coming on June 7. Making things even more complicated, Vanuatu's temporary prime minister withdrew recognition of Abkhazia on June 19, but it was reinstated on July 12 after the return of the permanent head of government.